So it’s just about mid-January. Spring is more than 60 days away. You need a plan to get you through the next couple of dark, cold months — a reason to haul yourself out of bed or off the couch and work out. A way to stay active until the change of seasons. Signing up for a spring race is a great motivator! Whether it’s for a 5K, a half marathon or even a full marathon, having a training plan to stick to can help you survive winter and look forward to spring (not that you aren’t already dreaming of warmer days, right?). Say you’re thinking of a half marathon. If you’re a beginner, you’d need at least 16 weeks (4 months) to train for the distance. If you’re experienced — that is, you’ve done a half marathon before or do significant walking already — you need about 10 to 13 weeks (3 or so months). And how ’bout that, the timing is perfect to start now and be ready for a race in April, May or June, depending on your experience level. With properly layered cold weather gear, you can do training walks outside in all but the most brutal of weather. In a pinch, you can clock several miles on the dreadmill. I’ve done 8 miles on the treadmill at my gym. It was pretty boring, but to keep it from being as deadly, I did the first 4 on one treadmill, watching TV, and the second 4 on a different treadmill on another floor, watching a Zumba class in action. In any case, I can help you put together a training plan and prepare for your event. Visit this page. And in the meantime, here are several suggestions for spring races. These are all in the New Jersey tristate area. If you live elsewhere, visit this site to search for an event in your neck of the woods. Info: Take a tour of the city of Brotherly Love. The race starts and finishes by the iconic Philadelphia Museum of Art, the giant stairs of which Rocky raced up in the same-named movie. The course circles into Center City and back, then goes out and back along the Schuykill River. Note: The race is already 85 percent sold out, so don’t delay! This is the race’s second year. I did it last year with friends. It was rainy and chilly, but the course volunteers were terrific! 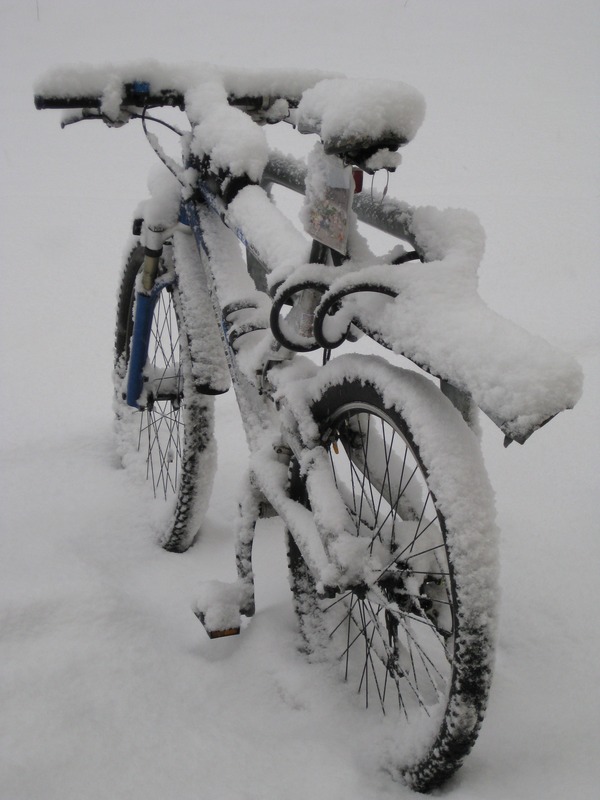 Weather can really vary in late March, so this year might prove to be balmy and sunny. Info: The course for this half marathon meanders through several of the campuses of Rutgers University. I did this race two years ago on a cool spring morning, the weekend after the Boston Marathon bombing. Race organizers passed out hundreds of small American flags to participants, and many racers had tributes to Boston on their shirts and such. The 3.5-hour time limit is welcoming to walkers. Note: This race, too, is quickly filling up and is already at 70 percent capacity. 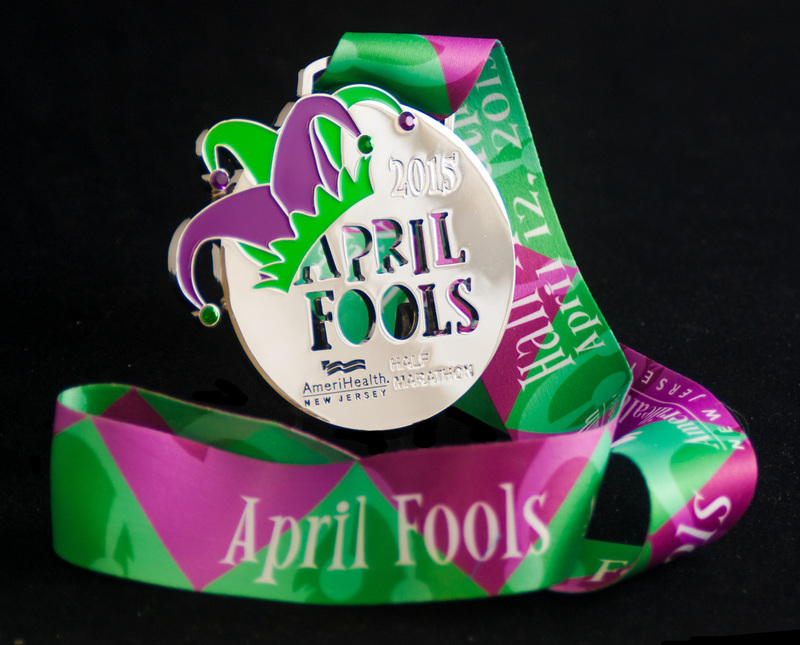 The April Fool’s race medal. Info: More than half of this course is on the boardwalk, with a lovely ocean view. The rest goes through neighboring towns, and the entire course is super flat. The weekend also includes a 7K and an 11K. The whole race has a fun spirit about it. Info: This event, sponsored by the magazines More and Fitness, is for women only. The course is centered in NYC’s Central Park. Demand is high, so if you’re interested, look into registering pronto. Info: Here’s another flat race with a course that in part goes on a boardwalk with an ocean view. It starts and finishes on the boardwalk in Long Branch, NJ. Info: This race is among those in the New York Road Runners stable of events. In particular, the NYRR holds a five-borough series. I’ve done the Queens leg but have four more to go! Someday… Registration is not yet open. Info: Are you noticing a theme here? This is yet another race in a beach town. This one is on my to-do list, for sure, but 2015 won’t be my year due to conflicting plans. The weekend also includes a 5K and an 8K. Info: And yet another Philadelphia race, at a time of year when decent weather is a better possibility! This list offers a starting point but I’m happy to help you find a race that meets your needs. Contact me — or share your suggestions in the comments. Thanks for the suggestions and the motivation, Joelle. I’m a slow runner and can’t seem to do a respectable 5K, but maybe I’m thinking too small. It may be time for an 8K, and a lot of the ones you listed are close by. You’re welcome! I focused this post on half marathons for the most part but there are tons of shorter-distance races, waaaaay too many to list. Visit the link I mention and do a search. The race in A.C. is a fun one, I did the half a couple years ago, and that has a 7K.